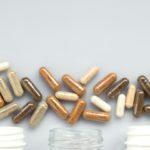 Please see this updated post on Essential Vegan Supplements for Natural Hormone Balance! Hii loves and happy Monday! I’m SUPER excited and relieved to report that the Woman Code protocol truly is working for my body… my period started on time this month rather than being 2 weeks too long in the luteal phase… and this happened after only 2 months of eating the recommended foods, cycle syncing my workouts and taking supplements (which we are talking about today). How amazing is that?! Not that I was skeptical of the protocol; I was hopeful and believed in the process but still… you never know how your body will react. While Alisa’s recommendations have worked for thousands of women, we’re all different and I thought for some weird reason that it might take longer for my body to adjust but I was wrong! Don’t worry if it takes a little longer for you to notice changes… like I said, there are so many factors that can delay the process so just keep at it and track/learn as much as you can along the way. In the beginning of this new lifestyle and living “in the flo” as Alisa calls it, I was along for the journey with you guys and we were learning together. We still are of course, but after noticing the positive changes (which provided some reassurance that I’m not losing my shiz), I believe in cycle syncing even more. While my cycle seems to regulating itself naturally, I have to be honest about my PMS symptoms… moodiness, cramps, bloating and cravings still made themselves known this month. Hoping these symptoms will subside and lessen as the months go on because this girl is tired of the ups and downs. By the way, this series feels like major TMI and sharing personal period details on the internet makes me cringe inside… but I keep telling myself that this issue is bigger than me and who really cares anyway? We need to be more open and this subject shouldn’t feel taboo because it happens every single month whether we like it or not. It’s imperative for more women to hear and learn about cycle syncing, unless they want to live with unnecessary symptoms for life, right?! Plus, your personal messages, emails and comments make me feel SO MUCH BETTER it’s unreal. Reading them makes my eyes swell up with tears because I can hear the frustration/hope/relief in your words and that alone makes it worth it. We’re not alone in this! Luckily, I haven’t received any negativity around the subject. Okay, continuing on from Part Two of this ‘Balancing Hormones Naturally’ series; today we’re talking supplements and herbs! Eating the right foods for each phase is the most important aspect of balancing your hormones naturally but there are a few herbs and supplements that can also really help to balance things out. Sometimes, we need all the help we can get! Keep in mind that these supplements work for me and my cycle; I’m not a doctor. Please read the Woman Code book first to see what you may need, depending on your goals and where your body is at currently. 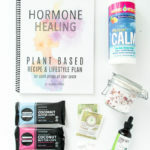 **Update: I recently released my NEW ‘Hormone Healing Plant Based Recipe & Lifestyle Plan’ that goes further in depth into supplements, with my updated recommendations!! Be sure to check it out! Alisa recommends flooding your system with vitamin B-6 for healthy progesterone levels, which is exactly what I needed. 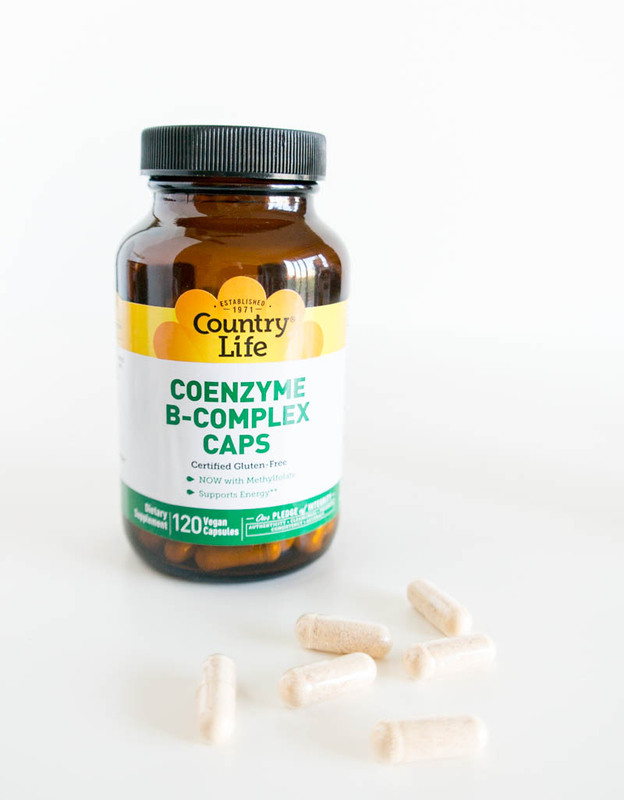 Being vegan and all, I tend to be lower in B vitamins anyway so taking a Coenzyme B-Complex Cap seemed like the perfect solution. I was actually taking these way before I learned about hormones, but now I take two per day instead of one and am much more consistent with taking them. My energy feels much more balanced! B vitamins are essential to help your liver rid of excess estrogen each month which in turn, reduces PMS symptoms. Since our livers become depleted of B vitamins quickly, it’s important to replenish our supply since they provide all the energy our cells need for fuel. B6 prevents skin inflammation and over-production of sebum which will reduce acne too. Bananas and chickpeas are also great sources of B vitamins! Most women are deficient in magnesium. 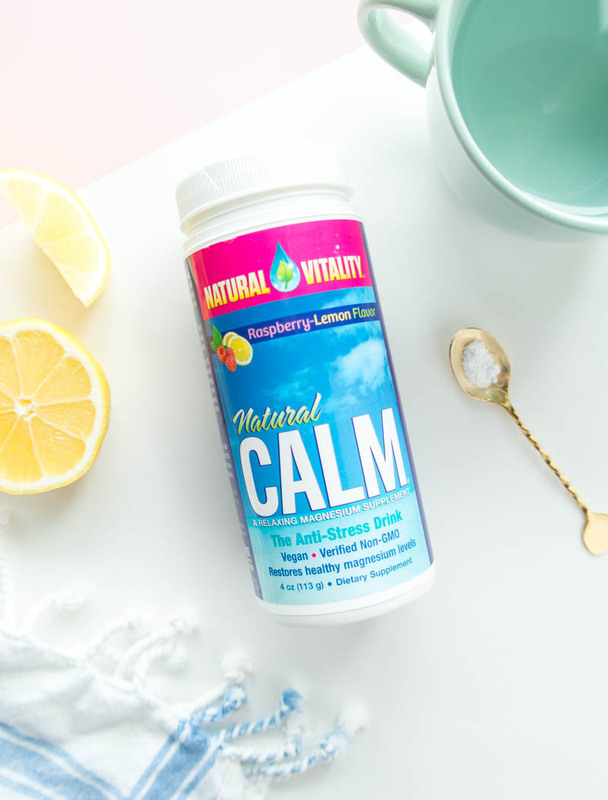 I dedicated an entire post to magnesium on how I take it every night before bed to unwind (it’s like liquid Xanax – but natural). Magnesium is anti-inflammatory and crucial for hormone balance. It’s also improves insulin resistance and takes stress off your adrenals. Even if your hormones are in balance, you should drink this CALM Magnesium Tea! 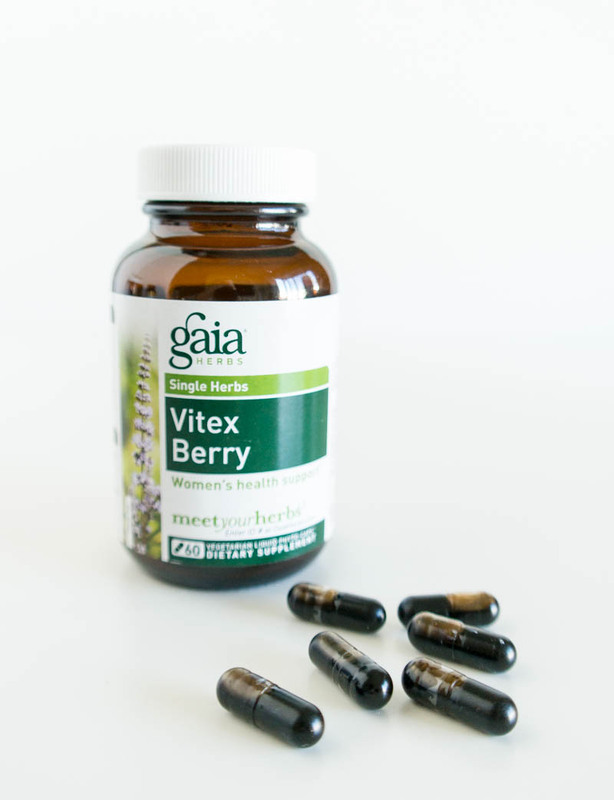 I no longer take Vitex Berry, but wanted to include it anyway because many women have major success with it. I took Vitex years ago after coming off the pill and while it did bring my period back, (which was major!) it did not help to keep it regular and my skin was still breaking out like crazy, so I stopped taking it. I also wasn’t doing any of the other recommended steps that we’ve been talking about here though. This powerful herb has been used by women for a long time. It calms the nervous system, promotes ovulation and increases production of hormones during the luteal phase, to offset estrogen dominance. It also helps your pituitary gland make more progesterone on its own. You should not need Vitex Berry for more than 6 months (it should work within 4 months). If you don’t have a period, it is recommended to cycle 25 days on and 5 days off. If you have a period but are using it for PMS, take a few days off of it each month. 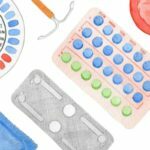 You should not start taking it until you’ve been off the birth control pill for 3 months. Do not take if you are younger than 18 years old or if you have PCOS as it can increase androgens in the body. Ritual is a fairly new brand I’ve been trying out the last month and so far, I’ve been loving it. There’s some overlap in B vitamins and magnesium (since I take those separately) but I love this supplement to fill in the gaps in case I am missing anything, especially Vitamin D, E, Iron and Omega’s. 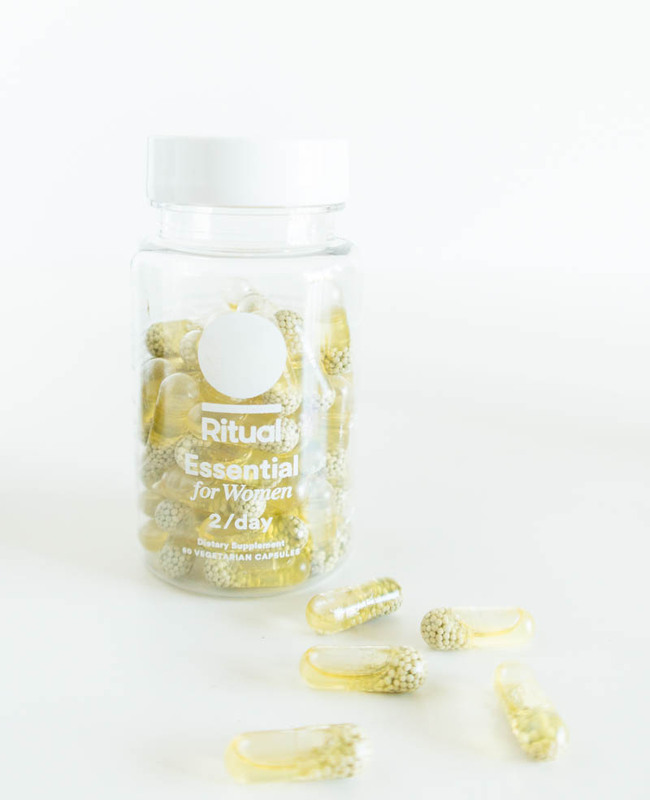 Ritual Essential vitamins were designed for women specifically with nutrients that women tend to lack most (and the capsule looks super cool since its clear). Check them out here for more info. Not a supplement, but cinnamon is such a powerful spice so had to include it! I sprinkle organic ground cinnamon on everything from my morning teecino to smoothies, oatmeal, baked goodies and sweet treats. Mainly for blood sugar stability, but it’s also antibacterial and improves digestion. Plus, it’s super yummy and naturally sweet! You guys know how crazy I am about greens. I can’t stress them enough! 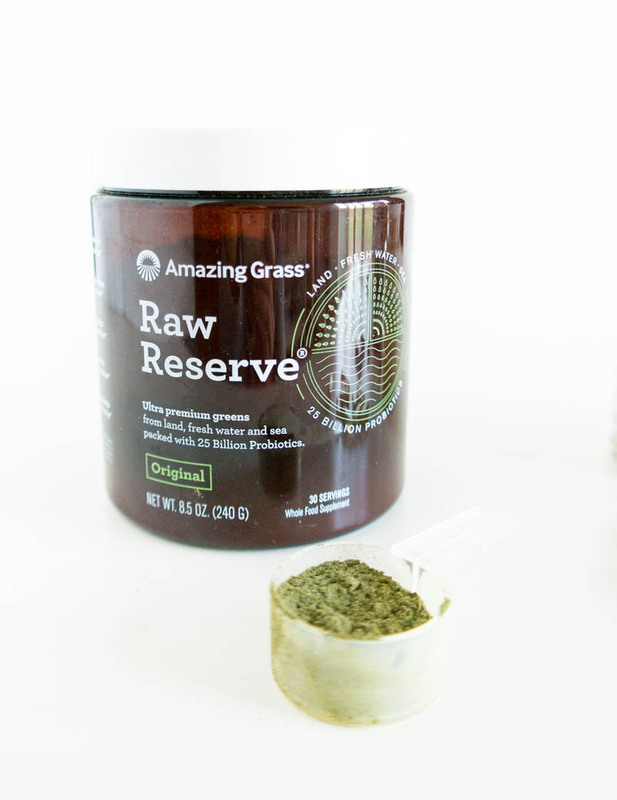 Not gunna lie though, this Raw Reserve greens powder smells and tastes like straight up seaweed, but it’s worth it. For your skin, hair, nails and hormones! Just add a scoop to a green smoothie and I promise, you won’t taste it at all. Remineralizing your body during your menstrual phase is essential and sea vegetables/leafy greens do just that. With this powder, you won’t have to buy spirulina, chlorella and E3Live separately, as it’s all-in-one. P.S. >>> I recently listened to this Facebook live video from Alisa for any and all issues with our periods whether its missing, late, irregular etc. – it’s super helpful and insightful! Definitely check it out and have it on in the background while you’re cooking, cleaning or driving! Let me know how you guys are liking this series and if you’ve ordered the book! Are you cycle cyncing? 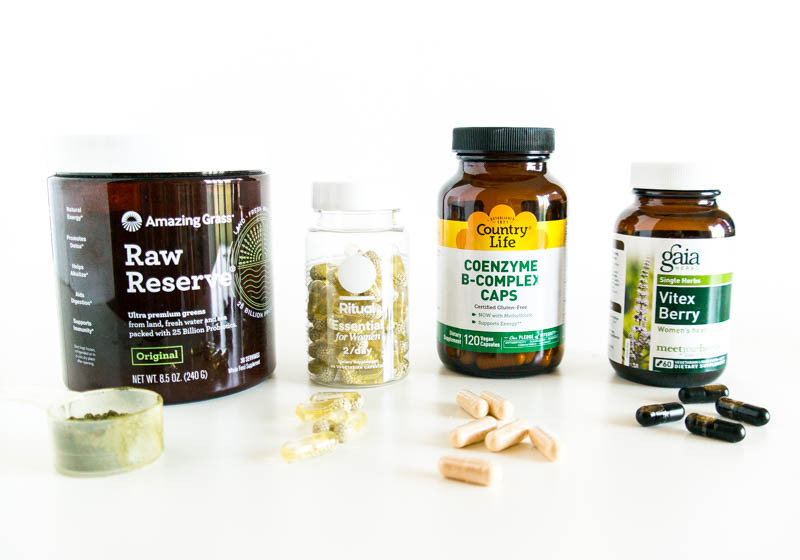 What kinds of supplements have you started for hormone balance?! Does the Raw Reserve have B 12 in it? 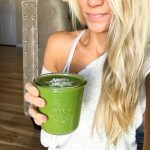 I’m sorry if that is a dumb question but I like to add Spirulina to my smoothie each morning to ensure I’m getting B 12. Thanks! Hi there! Are you not taking a separate probiotic supplement because the Raw Reserve has lots in it? Thanks! I do take separate probiotics a couple times per week because I don’t eat the Raw Reserve everyday but I kinda forgot to include them! Normally, I would rather get raw probiotics from actual food like coconut yogurt and raw sauerkraut! When I do take probiotics, they’re from Renew Life.